The Hallmarks of Cancer are ten anti-cancer defense mechanisms that are hardwired into our cells, that must be breached by a cell on the path towards cancer. The First Hallmark of Cancer is defined as “Self-Sufficiency in Growth Signals”. What does this mean? Before I explain how growth signals are intimately involved in the development of cancer, it is necessary to define and understand what growth factors are, and explain how they control normal cellular behavior. Growth factors are, simply put, substances that control the multiplication of cells. There are many different types of growth factors, but they all have several characteristics in common. They are all proteins, and present at very low concentrations in tissues but with a high biological activity. They are responsible for controlling essential functions within the cell; growth, specialization and survival. Growth factors also do not circulate in the blood stream; instead, they act locally in areas near the cells that produce them. The image above shows a growth factor known as Vascular Endothelial Growth Factor (VEGF). It is impossible to talk about growth factors and cancer without going over some of the basics of cell signaling. We are multi-cellular animals, and as such, our cells need to communicate with each other, so they can act in a coordinated manner in response to the environment. The basis of this communication comes from a process known as cell signaling. Growth Factors fit perfectly into Growth Factor Receptor Binding Sites. 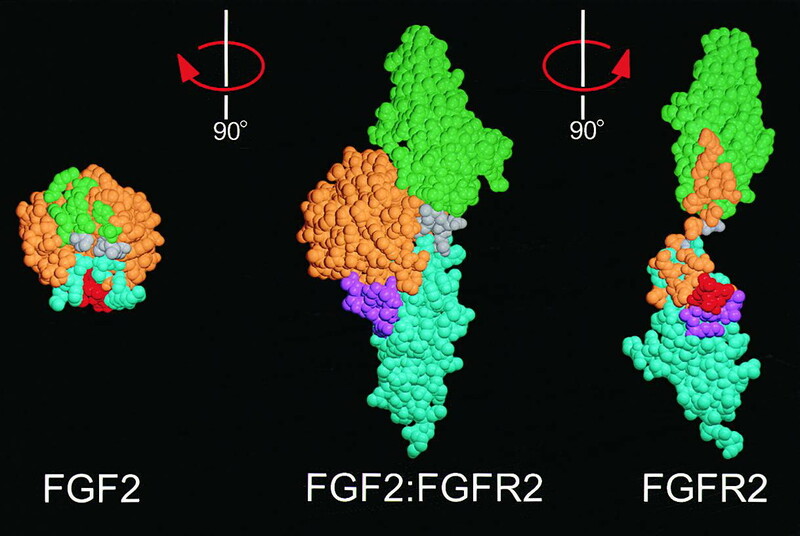 Two different types of Fibroblast Growth Factor (FGF1 and FGF2, left) shown bound to its specific receptor (center) and separate (right). Image credit: Alexander Plotnikov. The behavior of a cell depends on its immediate surrounding environment, known as the microenvironment. The assortment of growth factors in this microenvironment is the most important aspect regulating the behavior of that cell. All growth factors exert their effects by binding to a receptor. Receptors are proteins found on the surface of a cell that receive such chemical signals from the outside of the cell. Each growth factor has it’s own receptor; think of it as a key (the growth factor) fitting into a lock (the receptor). 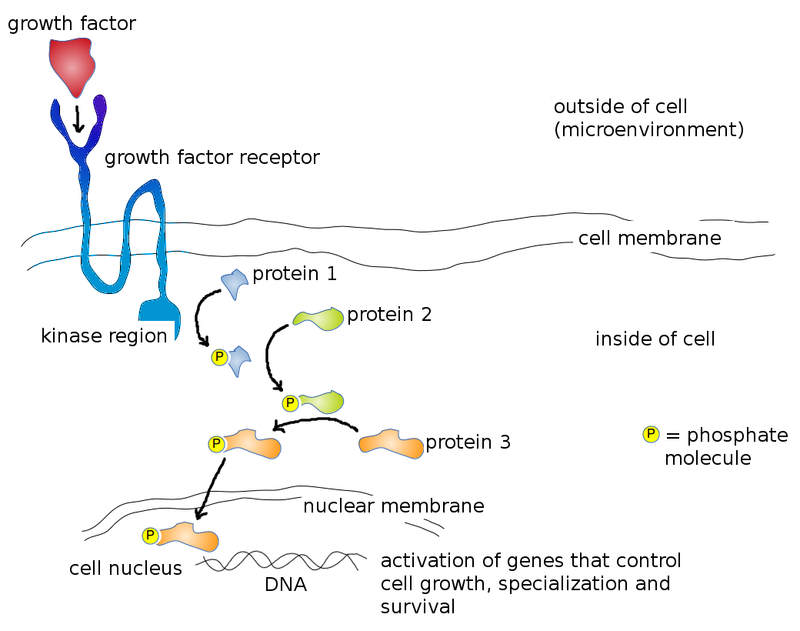 Growth factor receptors tend to be ‘transmembrane molecules‘; this means that one end of the receptor ‘sticks out’ through the cell membrane into the microenvironment while the other end projects inside the cell. By spanning across the cell membrane, growth factor receptors are able to communicate signals from outside the cell (e.g. presence of growth factors in the microenvironment) to the inside of the cell. Revisiting the lock and key analogy, think of it as a key that fits into a lock that protrudes through the door-frame, instead of being flush against the door. The binding of the growth factor to its specific receptor triggers a phosphorylation reaction inside the cell. Phosphorylation, or the addition of a phosphate group to a protein molecule, is an important step in cell signaling. This is because many proteins exist in an ‘on’ or ‘off’ state that can be switched by phosphorylation. Therefore, phosphorylation is a key step in regulating their activity. The enzymes that add phosphate groups to proteins are known as kinases; enzymes that remove phosphates are known as phosphatases. The exterior end of the receptor protein (the bit that sticks out of the cell) carries the growth factor binding site; the other end which projects inside the cell carries a kinase site. Binding of growth factor to the receptor binding site activates the kinase domain on the interior end of the receptor protein. This activated kinase, true to it’s name, then goes on to add phosphate groups to other proteins inside the cell, which then activate more proteins downstream, triggering a signaling cascade that finally ends with the activation of genes that bring about….you guessed it, cellular growth, specialization, or survival! The image below illustrates this process – I couldn’t find a decent one online so I made my own! The description above is an extremely simplified version of what happens inside a cell; in reality, it is not so much a linear signaling pathway as it is an interwoven, intricate signaling web, with promiscuous proteins from many different pathways activating and repressing one another. The image below is not meant to frighten you (!) 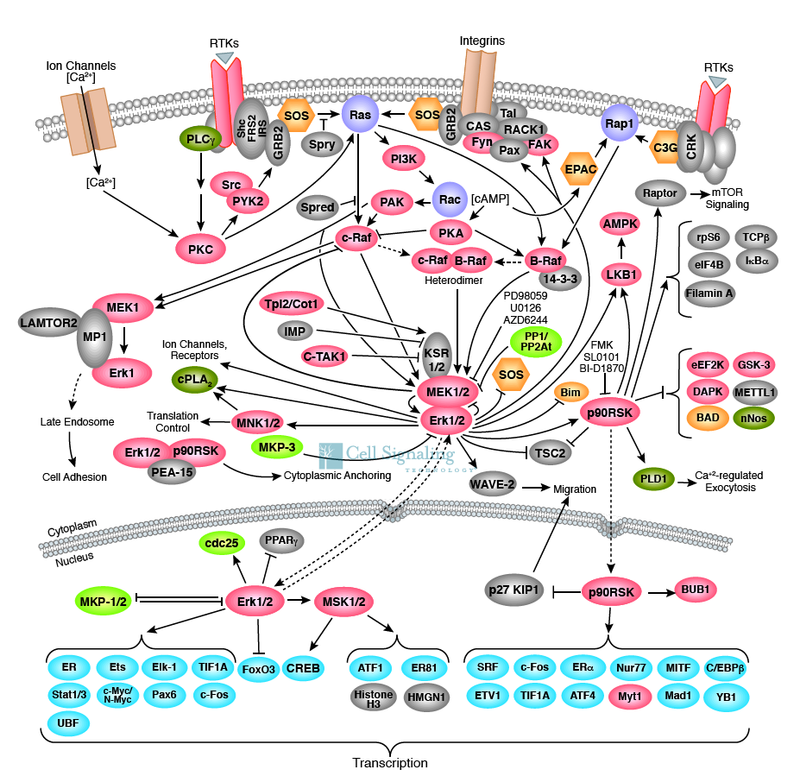 but rather to give you an idea how truly complex just one such signaling pathway, known as the MAPK/Erk pathway is. A truly complex web of cell communication! These are some of the proteins we know that are involved in a single pathway known as the MAPK/Erk pathway. Signals from the outside of the cell go through this web of signaling, ultimately ending up with the activation of genes involved in growth, specialization and survival of the cell. Image credit: Cell Signaling Technology. So now that we understand the basics of the molecular mechanisms behind cell signaling, what happens in a cancer cell that turns this orderly process so horribly awry? As you may have figured out, normal cells cannot divide without the ‘go ahead’ from growth factors. Even normal cells growing on a petri dish need growth factors supplied from animal serum to divide; if not they enter a dormant state and eventually die. Cancer cells on the other hand, do not need this ‘go ahead’. This liberation from being dependent on externally supplied growth factors removes a very critical checkpoint on the path towards cancer. How do cancer cells bypass this checkpoint? There are three common strategies; First, they can alter the level of growth signal itself. Normally, growth factors are made by one type of cell in order to act on another type of cell. 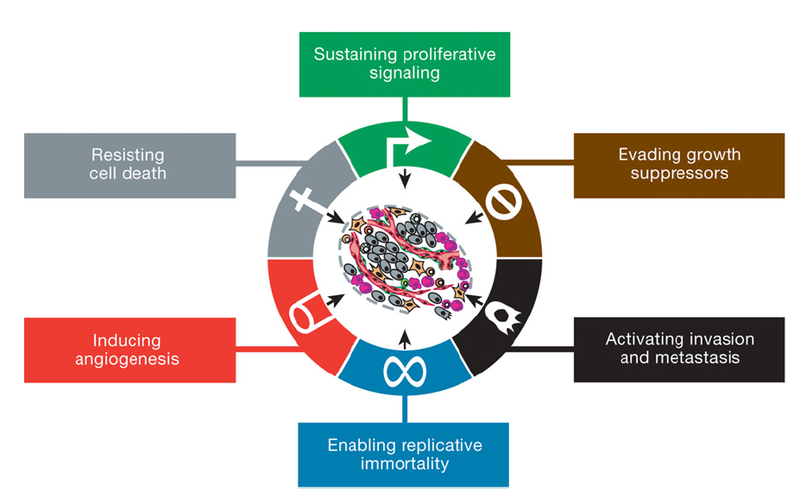 However many cancer cells acquire the ability to synthesize and secrete their own growth factors, stimulating others of their kind, which creates a feedback loop in which more cancer cells divide under the influence of growth factor to synthesize more growth factor and so on. If the key to the lock is typically provided by a caretaker, then this means having your own DIY key-cutting machine, so that dependence on a locksmith is eliminated. Second, the cancer cell can tweak the growth factor receptor itself, so that a larger-than-normal number of these receptors are present on the surface of the cancer cell. This means that the cancer cell becomes hyper-responsive to ambient levels of growth factor that would normally not be enough to trigger cell division. Additionally in some tumors, the growth factor receptor is structurally altered, sometimes lacking the regulatory regions, which results in the switch being permanently stuck at ‘on’. There is no need for a key, the lock opens without one. Finally, there are alterations further downstream of the signaling pathway, so that the requirement for growth factor and receptor are both bypassed. For example, one of the key downstream components of the growth factor signaling pathway is a protein known as Ras. Mutant Ras is permanently ‘switched on’. Mutant Ras is the most common gene in human cancer; 25% of all human tumors, and up to 90% of certain types of cancer such as pancreatic cancer have mutant Ras. Why bother with trying to unlock a door if the walls don’t exist? 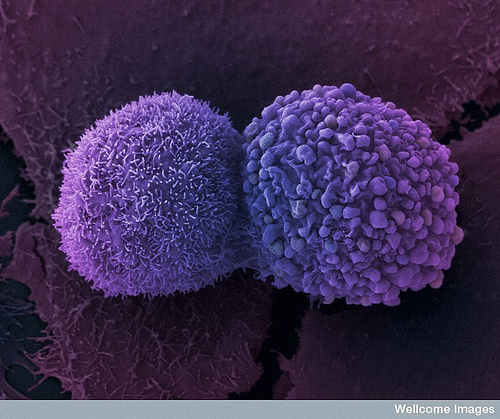 It is worth remembering that cancer cells cannot do what they do in isolation. The apparently normal bystanders, such as cells of the nearby blood vessels and connective tissue must also play key roles in driving cancer cell growth. In normal tissues, cells are instructed to grow by their neighbors; this is true of the tumor microenvironment as well. A tumor is not only made of cancer cells. Tumors should be regarded as complex tissues in which the mutant cancer cells have co-opted and subverted normal neighbor cells by inducing them to release growth factors as well. With these three strategies for achieving self-sufficiency in growth signals, cancer cells can successfully breach one of the ten anti-cancer defenses hardwired into our normal cells. The result is cells that are capable of growing uncontrollably, unstoppably and pathologically – in other words, cancer cells. The Six Hallmarks of Cancer, as published in 2000 by Weinberg and Hanahan. Image credit: Weinberg and Hanahan. 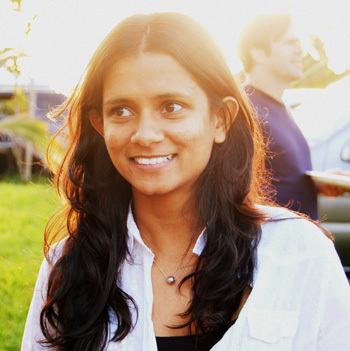 How can we use this knowledge about cancer to fight back? This is where the magic words ‘targeted therapies’ come in. Since cancer cells hijack normal growth factor response pathways to become self sufficient, it is logical for us to target these errant pathways specifically. If a growth factor receptor is stuck on ‘always on’, for example as a perpetually active kinase, then finding a specific inhibitor to stop the activity of this kinase would starve the cancer cell of the signal it is dependent on for uncontrolled growth. Two such drugs, discovered in the 1990s, utilize this principle. Gleevec, used as treatment for chronic myelogenous leukemia and Herceptin, for the treatment of breast cancer, both inhibit specific components of growth factor response pathways to starve the cancer of this signal. Earlier in this article I mentioned the Ras protein, which is frequently mutated in cancers; work is currently underway to find small molecules that are capable of inhibiting Ras. An exciting era of targeted cancer therapies lie ahead of us, because we have a deeper understanding of how cancer happens. This is the first of a series of articles that I will be writing about the Hallmarks of Cancer. This series is based on two review papers published by Robert Weinberg and Douglas Hanahan in the journal Cell. Both papers are Open Access, and you can download them here (2000) and here (2011). The authors simplified cancer down to ten underlying principles, shared by every single cancer cell. Each of these ten changes in cell biology represent the successful breaching of an anticancer defense mechanism that is hardwired into our normal cells and tissues. These multiple defenses are the reason why we don’t all get cancer within hours of being born, or indeed being conceived! Hello! I am a highschool student that is attending a premed summer program. One of my assignment was to read, “The Hallmarks of Cancer.” After so many attempts to understand it, I wanted to give up the medical field. However, I stumbled across this website that made everything so much clearer! Thanks alot! Will I be able to use this as a substitute for reading the original article? 🙂 I hope so!